Brilliant 20-song retrospective compilation from the much loved and sorely missed Australian indie pop band The Sugargliders. Based around brothers Josh and Joel Meadows, the band released ten singles and one album between 1990 and 1994 on legendary pop imprints Summershine Records in Australia and Sarah Records in England. Just 19 and 16 when they started, these boys from Melbourne’s far eastern suburbs wrote simple, original pop songs, brimming with an unpolished emotional honesty that earned the band an international following. Mostly self-taught, they aimed to create something new, something true, from the world as they experienced it, complete with its beauty and its injustice. It was not entertainment as much as something they knew they had to do. Whether they were singing about girls, property developers, or police car chases, you could tell they were singing what they believed, from deep in their hearts. The brothers were joined, at different times, by Marc Fulker on drums and Robert Cooper (The Earthmen) on bass. Their recordings improved under the guidance of Mark Murphy (Ripe) and Adam Dennis (The Jordans). Summershine released the early vinyl singles, before they found a home at Sarah Records. It was a good match. Both label and band believed in changing the world, one duo-tone sleeved perfect pop 7” at a time. They went to England. They returned to Melbourne. Ten singles in four years and they were gone. A Nest with a View, released in collaboration with Popboomerang Records in Australia, collects the finest moments from these long out-of-print and highly cherished vinyl singles. What was the Sugargliders’ essence? Perhaps a stark honesty or lack of pretention. They were also deeply idealistic – so much so that it couldn’t last. But perhaps something did last. 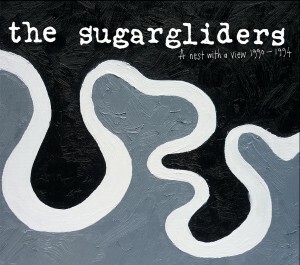 These 20 songs, lovingly remastered, capture the sparkle, the tenderness, the exuberance, the idealism and the honesty of The Sugargliders. A flawed but beautiful collection to touch the conscience and rekindle our fickle hearts. Se oggi vi volete crogiolare con un po’ di sano indiepop vecchio stampo, A Nest With A View potrebbe fare al caso vostro. È uscita infatti qualche giorno fa per la Matinée questa graziosa raccolta degli australiani The Sugargliders, che raccoglie un bel po’ di singoli usciti negli anni 90 per la celebre Sarah Records. Balsamico. --Frigopop!